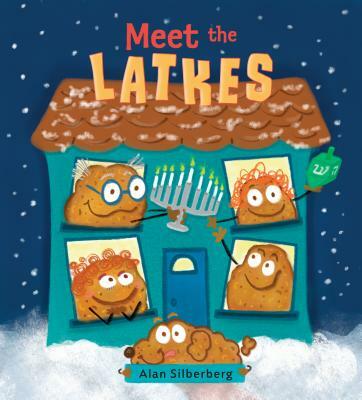 Imagine James Marshall's The Stupids celebrating Hanukkah, and you'd get the Latke family! Lucy Latke's family is just like yours or mine. Except that they're potato pancakes. And also, they are completely clueless. After lighting the menorah and gobbling the gelt, Grandpa Latke tells everyone the Hanukkah story, complete with mighty Mega Bees who use a giant dreidel to fight against the evil alien potatoes from Planet Chhh. It's up to the Latke family dog to set the record straight. (To start with, they were Maccabees, not Mega Bees...) But he'll have to get the rest of the Latkes to listen to him first! Alan Silberberg (www.silberbooks.com) is an award-winning author, cartoonist and children's TV creator who has worked with Nickelodeon and Disney. He's the author and illustrator of three previous middle grade novels including Milo: Sticky Notes & Brain Freeze, which won the Sid Fleishman Humor Award and is currently in development to become an animated TV series. Though he’s been eating latkes for years, this is Alan’s debut picture book.